The Australian dollar was seen trading slightly weaker against the greenback even as the euro and the yen strengthened in early trading today. The focus was the Australian government mid-year budget update which comes amid broad concerns that the deterioration in the budget deficit could trigger ratings downgrade from the coveted AAA sovereign credit rating. Australia is one of the few developed economies to still retain the top ratings grade. The Australian dollar fell for the past three straight daily trading sessions after price failed to post a rebound above 0.7500. At the time of writing, AUDUSD is seen trading below the recently broken support level at 0.7400. According to the treasurer, the budget is expected to worsen by around AUD10 billion over the next four year term but pledged that the books would be balanced by 2020 - 2021. The budget report was taken as being "satisfactory" by the ratings agencies which confirmed the AAA rating statement and said that no further action was necessary. Among the three ratings providers, Standard and Poors global ratings was seen as the most likely to announce a downgrade, but the firm said that the budget release did not have any ratings impact. The technical landscape in AUDUSD is one that is bearish after price bounced off 0.7400 previously to reverse near 0.7500, forming a bearish flag pattern which came after the strong bearish declines off 0.7760. This potentially signals a continued decline towards lower support at 0.7225 followed by 0.7183. 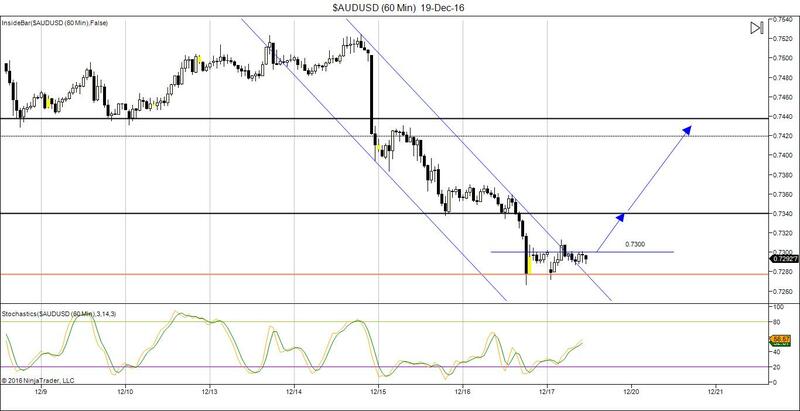 Although the bias remains to the downside, there is scope for AUDUSD to post a retracement in the near term. Look for an hourly close above 0.7300 and purchase daily CALL's as price is likely to target the previously breached support level at 0.7340 in order to establish resistance. The Stochastics on the 60-minute chart is likely to dip lower before trigging a buy signal which will be the cue to purchase daily CALL options for 21:00 GMT expiry time.